The #1 deficient mineral in kids and women is iron. Supplement products, luckily, are the easy fix to ensure your health needs are met. Taking Iron deficiency supplements may help and reduce the risks. This essential mineral’s function is to transport oxygen to the body through the blood. Without it, the muscles and tissues that need oxygen will function poorly. With guidance from your physician our iron supplements dosage ensures you get the recommended amount to keep your body functioning properly and helps with deficiency restoration. Whether they are pregnant, breastfeeding, or menstruating, women are often fatigued and may need iron deficiency supplements to assist in augmenting their diet in reaching the recommended dosage. It can be difficult consuming the proper amount of iron for women strictly through their diet, which commonly leads to iron deficiency. 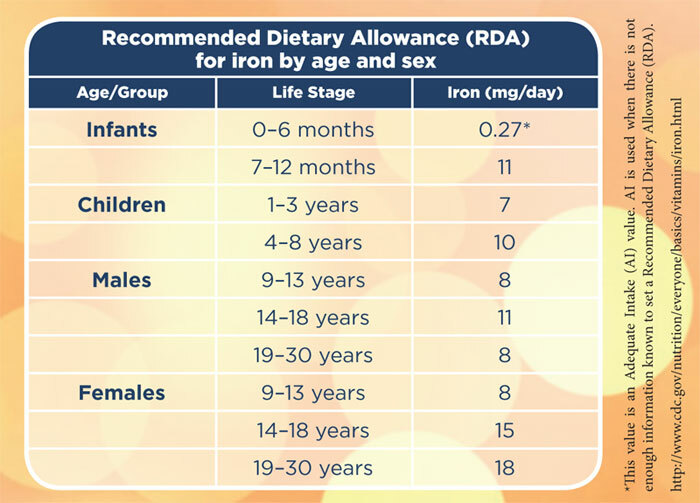 Children often fall short of their recommended dosage (Contact your physician to determine if an iron supplement is needed) and may need an iron supplements for kids. Their bodies are growing so rapidly that supplements are a must. Without supplement products or vitamins, kids rarely get enough of their recommended daily allowance and this deficiency can affect their overall health. Food products like whole grains and meat have a very high dosage, but often kids are not interested in wheat bread or liver. Without a supplement like our iron deficiency supplements for kids, they may not get all that their body needs to grow. Proper dosage for kids should be between 7 mg and 10 mg per day depending on age. The dosage for teenagers is 8-15 mg per day. Supplement dosage for pregnant women is 27 mg per day. For women who breast feed, their ideal iron supplement dosage should be 9 -10 mg per day. Our vitamins and supplements are gluten free and are easy to digest and you don’t get the negative side-effects that you get with other products. Our vitamins and minerals for women and kids will help you meet dosage recommendations. Iron is an essential mineral and is important to your body that you must still include Iron-rich foods like meat, cereal, grains, and fish are key, but if you need additional supplementation our vitamins and supplement products will help keep your body in balance and restore deficiency. Don’t hesitate, take care of your body today, by ordering now! Contact your healthcare provider before taking any iron supplement. * Statements on this page have not been evaluated by the Food and Drug Administration. These products are not intended to diagnose, treat, cure or prevent any disease.